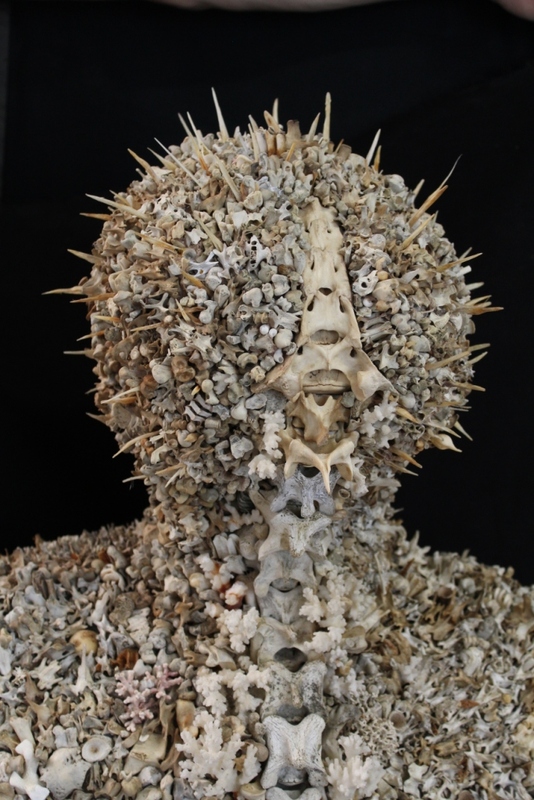 A life-size portrait bust of a warrior from the Kiribati Islands made using paper and wood as the base, crushed bone on the face and thousands of small bones from rabbits, possums, ferrets, stoats, a cat and numerous small birds covering the rest of the object. The spines on the head are from a large Snapper. 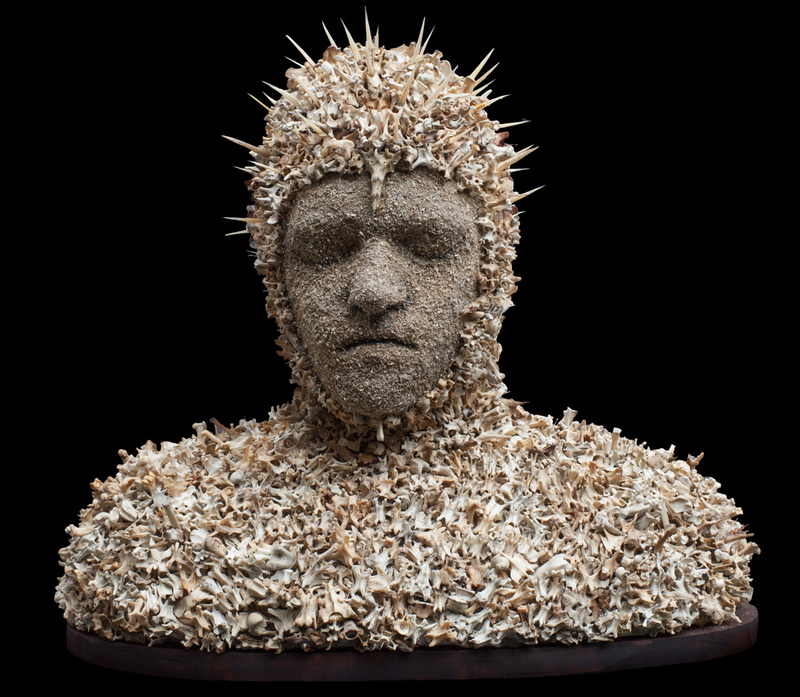 The piece is partly inspired by a life-size model in Otago Museum (Dunedin) of a Kiribati Islander wearing a helmet made from the skin of a porcupine fish but it also references the films – ‘Hell-raiser’ and ‘Prometheus’. It was finalist in the Wallace Art Awards in 2014 and in the signature piece awards at the New Zealand Art Fair in 2015. Click here to watch a short video clip of the head being rotated. This life-size bust with the head of a sheep but the body of a young woman piece relates to my long-standing interest in the history of land sales in New Zealand. In the late 19th Century ‘business men’ such as William Larnach sold large parcels of land in Otago to naive buyers overseas who thought they were buying viable sheep runs. In fact by the 1870′s much of Otago was over-run (as parts still are today) by a super-abundance of rabbits which made sheep farming untenable. 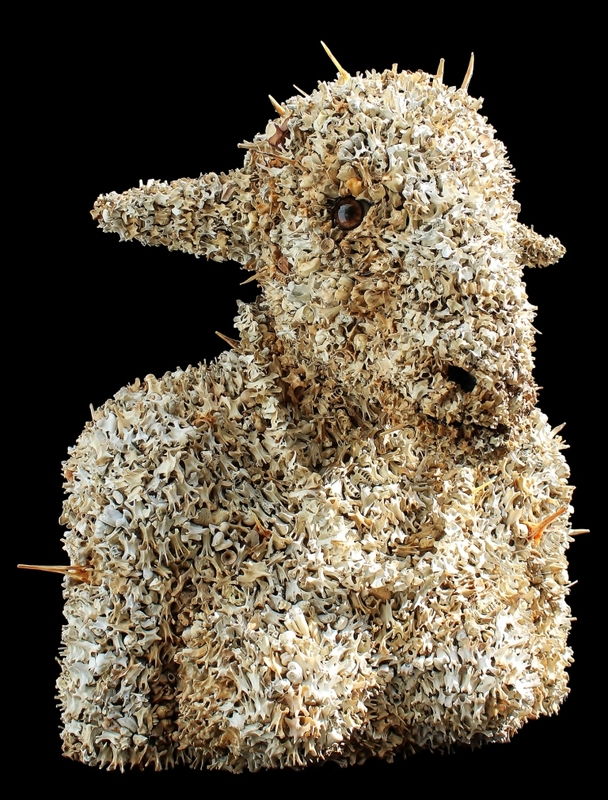 Hence an imaginary sheep made of thousands of rabbit bones. The only bit of ‘real’ sheep is the spine made of sheep vertebrae. There’s also the odd fish vertebra to create the spikes to create the illusion of a fleece that is soft yet sharp. Apart from the fish bones all of these bones were found in one of the old gold mining areas in Central Otago, New Zealand, which is still over-run with rabbits to this day despite the introduction of calci-virus in the 1990′s and a lot of professional shooters trying to keep the numbers down.The necklace in the picture from the front which comes with the bust is made from the atlas bones of approximately 200 possums. I decided I liked the back of my previous bust (Oves dei) more than the front so I determined to see if I could make a faceless bust highlighting two vertebral columns which would connect front and back. I had also acquired a large piece of coral which was unfortunately damaged in transit but the broken coral inspired the idea of trying to create a piece that looked halfway between a traditional bust and a natural outcropping of coral. 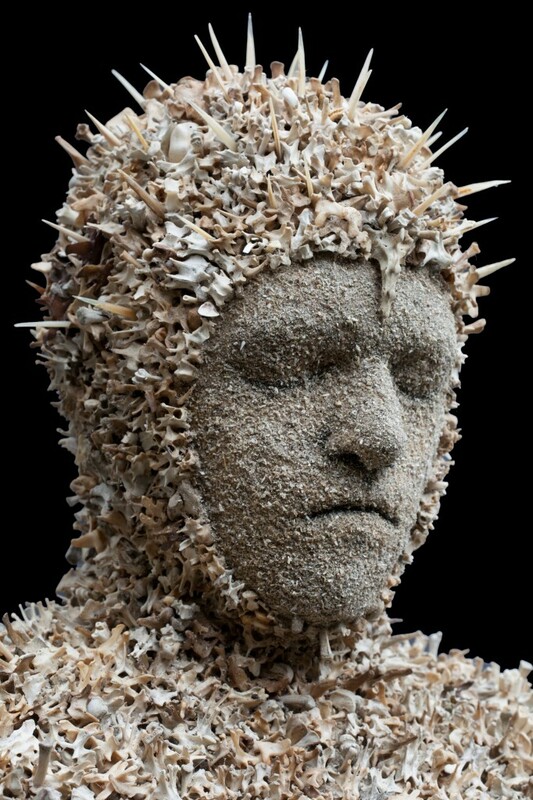 Or perhaps a bust that had been submerged in the ocean for years and gradually covered with its own small reef. As always I wanted the work to look as if it had grown itself. This work has more layers of bone than either of the previous busts and the textural complexity is hard to capture with a photograph. 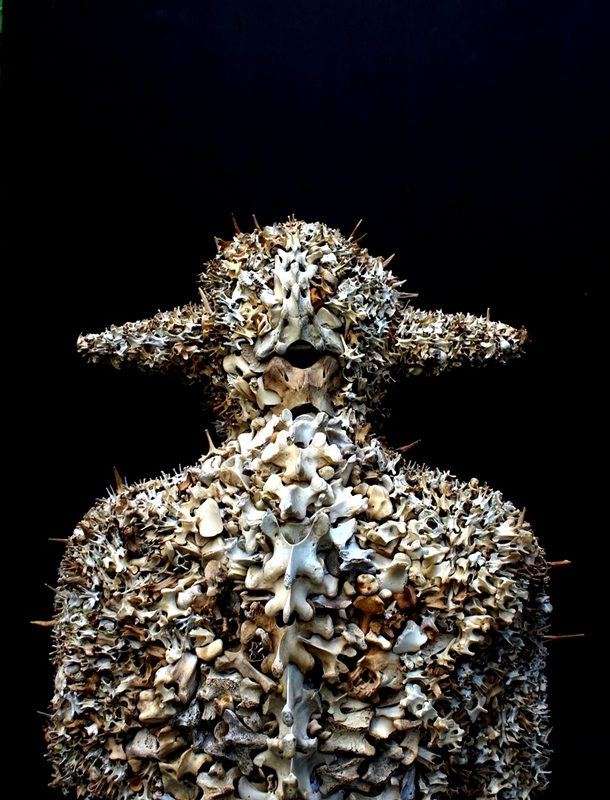 The work is composed of the usual mixture of found rabbit,possum and bird bones(mostly from Central Otago) and fish spines from the dorsal fin of large snapper.